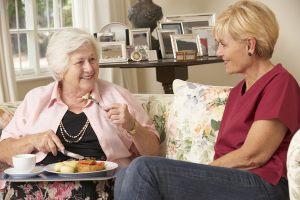 Are You Forgetting These Important Protections When Caring for Your Mom? Home Care Covington TN – Are You Forgetting These Important Protections When Caring for Your Mom? You’ve thought of a lot of ways to keep your mom safe. You’ve put in security alarms. She has a medical alert system. She even has a video doorbell now. Have you forgotten anything? Who is Monitoring Her Time Outside? Your mom may love going outside. She works in her gardens daily. She takes her dog for long walks. Is she outside for too long when the sun is out? Is she in danger of getting frostbite in the winter or heat exhaustion in the summer? What measures are in place to make sure she doesn’t spend more time outside than is safe? Is she remembering to put on sunscreen and a hat? Does she drink enough water? These are all important concerns. Seniors often drink less water than they should. They also don’t often realize they’re too hot or too cold soon enough. Does Your Mom Have Friends? After retirement, people move to new locations looking for warmer weather or a lower cost of a living. If your mom’s friends have moved on, she may be very lonely. She eagerly awaits your visits, but the rest of the week she feels lost. A pet can offer a level of companionship, but it may not be enough for your mom. The companionship of a home care aide can change her outlook and keep her from being lonely, isolated, or depressed. During the day, how much time does your mom spend online? Is she prone to going onto social media sites like Facebook and chatting with people? If she’s online at all, how safe is she? Is she using a very secure password? Does she have a firewall in place and a security suite that protects her from spyware, ransomware, viruses, and malware? Does she understand how to identify scams in her emails and text messages? Does she know what she shouldn’t share online? Is she likely to post that she lives alone? Even if she doesn’t give out her exact address, it’s information that a person can easily research online using a name and city of residence. How About Home Care Services? You can’t always be there. It’s hard when you have a family of your own and a job. Even when you can’t be there, you can hire a home care provider and make sure someone else spends time with your mom from Monday to Friday. There’s an added benefit to hiring home care services. When you arrive on a weekend to spend time with your mom, everything’s been done. Her laundry’s set. Her house is clean. She’s eaten well all week. You have the day for fun outings and activities. Learn more by calling our home care agency. This entry was posted in Home Care Covington TN, Safety at Home and tagged Home Care Covington TN. Bookmark the permalink.